Tunisia held England for long periods in the match but a Harry Kane brace pulled England through to an opening group match win. Group G at the 2018 FIFA World Cup started today and this time around, did not produce any upset results. Group F also concluded its opening matches as well. Do not let the scoreline fool you. England should have been ahead of Tunisia by the time the half-time whistle blew. Instead, they had wait for a stoppage time goal from captain Harry Kane to gain their first three points at the World Cup. England started off well, threatening Tunisia's goal at every opportunity in open play and on set pieces. Their first and Kane's first goal came in the 11th minute when a corner was floated in by Jordan Henderson and was met by Harry Maguire. Maguire's header was saved by Mouez Hassen but Kane was there to tap in the rebound. Unfortunately for Hassen, that was the last save he made in the game before picking up an injury and being substituted in the 16th minute. Jesse Lingard and Raheem Sterling all had chances to put the game to bed for England but somehow contrived to miss their easy opportunities. Those misses would come back to haunt England in the 35th minute. As a cross came into the area, Kyle Walker fouled Syam Ben Youssef and the referee awarded the Tunisians a penalty. 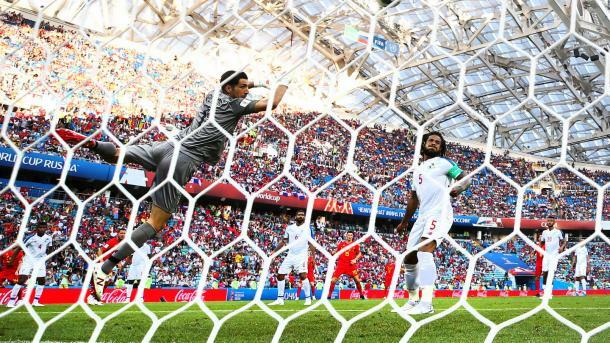 England goalkeeper Jordan Pickford guessed the right way but Ferjani Sassi​'s effort was too well-placed and brought Tunisia back in the game. In the second half, Tunisia sat back and dared England to break them down which they could not do. It wasn't until the first minute of stoppage time that Kane was able to capitalize on another Maguire header to give England all three points. This was a solid performance for England who on another day, could have scored three or four goals. Once they conceded however, their heads did drop but they showed good resilience to keep pushing and got their reward for it. 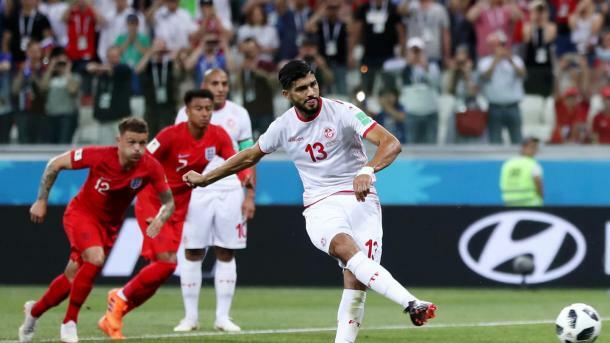 Tunisia may have been sucker-punched by that late Kane goal but their performance in the second half was something they can build on for their next games in the group. In their first ever World Cup match, Panama saw just how much they would have to do if they have any hope of moving past the group stages. The CONCACAF representatives were no match for Belgium and had it not been for an impressive performance by their goalkeeper, Jaime Penedo, the scoreline would have been much worse than 3-0. Belgium were not entirely convincing but they have enough in them to be able to score three goals and stay on top of Group G for the time being. Dries Mertens tested Penedo early in the match but the Panama goalkeeper stretched out a hand to keep the score at 0-0. In the 21st minute, Román Torres almost scored an own goal as he tried to stop Romalu Lukaku from capitalizing on Kevin De Bruyne​'s tantalizing cross. Belgium continued to test Panama's backline and finally got their breakthrough in the 41st minute thanks to a great first-time volley by Mertens. Torres headed away a cross that came into the area and Mertens got to the rebound first and lobbed the goalkeeper for the opening goal. Michael Murillo could have equalized for Panama in the 54th minute when he was put clean through on goal but Thibaut Courtois closed him down quickly and blocked the shot. Belgium then made it two in the 69th minute when De Bruyne's cross using the outside of his foot was met by Lukaku who finished well from close range. Lukaku then made it three in the 75th minute as Belgium broke and Eden Hazard slipped him through the Panama backline. The scoreline was a fair reflection of the game as Belgium threatened throughout and Panama seemed nervous on the big stage. It may end up being a long tournament for the newcomers based on today's performance while Belgium will know that they have taken a good step forward towards moving on to the knock out stages. This was not the prettiest match to watch for the neutral but those supporting Sweden will be happy with the opening day win against Korea Republic, thanks to a penalty Andreas Grandqvist. Both teams seemed determined to foul just as much as they could possibly get away with and the fact that only three yellow cards were shown shows how lenient the referee was with some of the tackles flying in. The first chance of the game finally came in the 20th minute when Jo Hyeonwoo made a great point blank save to sop Marcus Berg from putting Sweden in front. Berg then had another opportunity to score but some desperate defending kept the scoreline at nil-nil. Koo Jacheol almost gave Korea Republic a shock lead in the 53rd minute but his header went just wide of the near post. 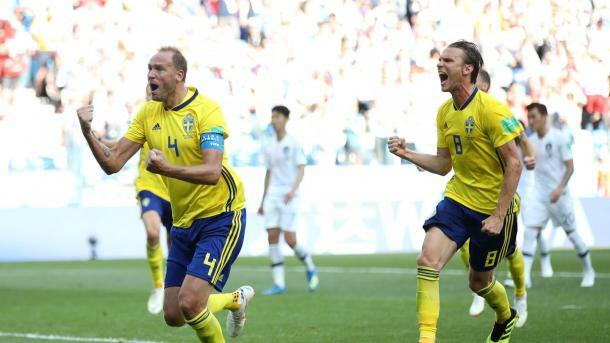 Sweden got the breakthrough they were looking for when Kim Minwoo fouled Viktor Claesson in an attempt to clear the ball. Grandqvist stepped up and sent Hyeonwoo the wrong way to score what proved to be the winner. Sweden made it difficult for themselves at times with some uneven attacking play but credit must go to Hyeonwoo who kept a lot of the chances that Sweden did create out of his goal. Korea Republic will look to their next game to try and improve on their own performance.